The global SCADA market is likely to demonstrate consolidated structure with less number of players are holding major share in the global market, finds Transparency Market Research (TMR). The manufacturers are largely focused towards mergers and acquisitions in order to strengthen their presence and maintain global outreach. The major players are largely focused towards expansion of product portfolio in order to enhance the market penetration in the year to come. Some of the players operating in the global SCADA market are Schneider Electric, Yokogawa Electric Corporation, Tesco Controls Inc., and Eaton Corporation. As per a report by TMR, The revenue generated by the global SCADA market is likely to stood at US$1,267.4 mn and projected to touch valuation of US$2,172.1 mn by 2025 end. The global SCADA market is likely to register steady CAGR of 5.60% during the course of forecast period from 2015 to 2025. On the basis of end use, industrial segment is likely to account for maximum share in the global SCADA market. The increasing contribution from food and beverage sector is likely to be one of the prime factor expected to account for huge share in the global SCADA market. From geographical point of view, North America is likely to dominate global SCADA market. The growing popularity of cloud based SCADA is one of the prime factor stimulating demand in this region in the coming years. Further, Europe is likely to account for health growth in the year to come. 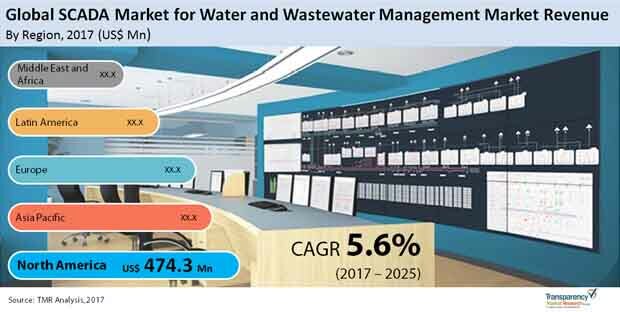 The escalating demand for waste water treatment and water treatment is one of the important factor positively triggering growth of the global SCADA market for SCADA waste and waste water management in the coming years. The advancement in technology and growing government funding are some of important factors promoting growth of the global SCADA market in the year to come. The major players in the market are focusing on emerging economies and this is expected to enhance growth of the market during the course of forecast period. The growing need for waste water management is also one of the key factor promoting growth of the global SCADA market. The growing government waste water management plan is other factor majorly attributing towards market growth in the year to come. These are some of the prime factor propelling demand for global SCADA market in the year to come. Additionally, the rising infrastructure investment is one of the key factor propelling demand for the global SCADA market in the coming years. In addition, growing complexities in management of wastewater facilities and water are likely to be another reason driving growth of this market in the coming years. On the other hand, the high cost associated with the installation is one of the key factor negatively impacting overall growth of the global SCADA market. In addition to this, design complexities are other factor restraining growth of this market, globally. However, the growing popularity of cloud based SCADA for waste water and water management is one of important factor positively impacting growth of the global SCADA market.